Dress up your event while giving your guests a sweet treat with our Personalized Champagne Bottle Box Party Favors! These clear plastic bottles are easy to use with their removable bottom panel that is used to fill and access the goodies inside. The top of the bottle features a shiny silver cover to resemble a champagne bottle's foil-wrapped cork and the front of the bottle is the perfect place to affix the personalized label. Each measures 4" tall x 1 1/2" wide. Some assembly required, using the easy-peel sheets to apply the labels to the favor. Note: For sample orders, you will receive a representative sample of the personalized item only. Hi would it be possible to get a sample sent to me? Absolutely, you can get a sample of Personalized Champagne Bottle Box Party Favor at a special price of $0.49. Just enter 1 in the quantity box then complete the check out. Hi, how many ounces are the Personalized Champagne Bottle Box Party Favors? 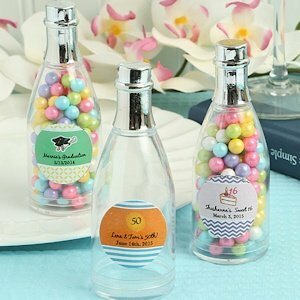 The Personalized Champagne Bottle Box Party Favors can approximately hold 5.22 oz but are not recommended for liquid as they have a removable bottom panel. They are only recommended for solids like candies or other goodies. How many ounces are these bottles? Need to calculate how many candies(m&m type)i would need to fill each bottle.. I'm sorry, we don't have that value since it's not meant to hold liquid. However they measure 4" tall x 1 1/2" wide. 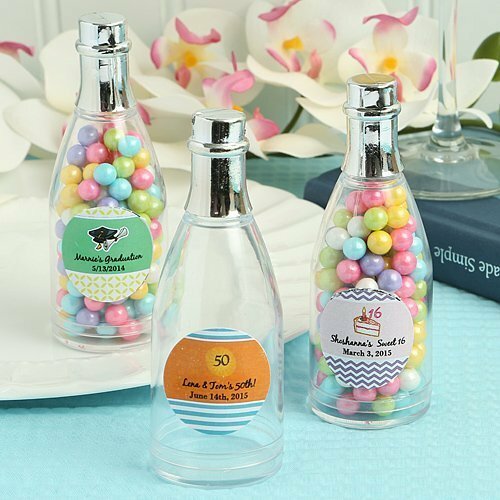 Based on this same info from a similarly sized jar, we expect that our Personalized Champagne Bottle Box Party Favors would hold approximately 3.5 ounces of Plain M&Ms.